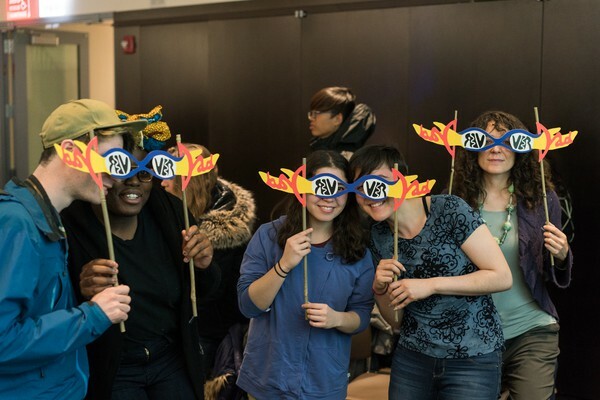 PALABRArmas debuted in the Neubauer Collegium on March 29, the first of many events to celebrate the University’s 2018 Sherry Poet-In-Residence, Cecilia Vicuña. Born in Chile and based in New York City, poet, artist, filmmaker, and activist Vicuña engages in work that reacts against violence done to both people and the environment. 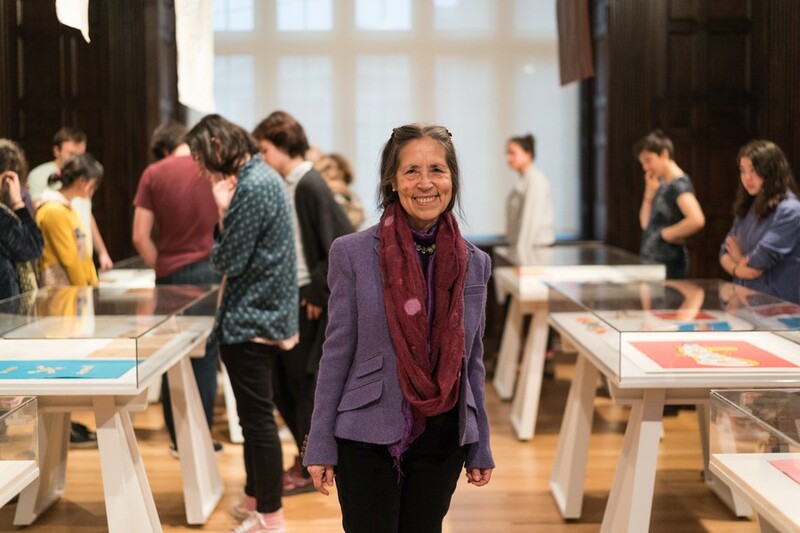 Her 22 multilingual books of poetry and art explore memory and decay, as do the “precarious works” she has been creating since 1966—art installations made from waste materials and natural elements that eventually decompose. As such, much of Vicuña’s work meditates on loss. Almost lost to the public, a suite of drawings that she completed after visiting the Amazon in 1977 is being shown for the first time through PALABRArmas, and banners that were once destroyed were remade for this installation. The exhibit centers on its title, a portmanteau combining palabra (word) and arma (weapon). In one of the drawings on display, blue crayon spells out the different ways of reading the word; it is at once Palabrarma, Palabr-arma, and palabrARMA, each of which gestures toward the idea of word as weapon. Vicuña writes of “loaded words”—language that carries bullets of meaning. “Words are weapons, perhaps the only acceptable weapons,” said Vicuña during a lecture at the Neubauer Collegium last Tuesday. She is petite in person, but her presence is remarkable; although she speaks softly, each word rings with conviction. Vicuña created “Palabrarmas” while she was studying abroad in London and Bogotá, exiled from Chile after Augusto Pinochet staged his coup d’état of September 11, 1973. As Vicuña explained during a student Q&A in the Logan Center on March 30, Pinochet’s dictatorship was a turning point for her art; it meant the cessation of democratic government and “cultural riches that were communal.” What became both a heartbreaking truth and a force that fueled her work was “the memory of the potential that was cut off”—not just for Chile, but for the world. Vicuña first came to Chicago in 1965, as a bright-eyed 17-year-old. Coincidentally, a group of Chilean economists nicknamed the “Chicago Boys” were studying at that time at the University of Chicago under Milton Friedman and would later return to Chile to help Pinochet fulfill his coup. But now, in 2018, Vicuña is back in Chicago with art, much of which reacts against the coup, on display at the very university where the Chicago Boys studied. “[Life comes] full circle,” Vicuña remarked. Despite the coup’s effect on her work, however, there is no violence in Vicuña’s art. The exhibit is filled with images of hearts, hands, and people, most often women. Vicuña repurposes the language of military violence for humanity, exchanges arms for art. The way she performs her poetry in powerful whispers, dynamic and unrestrained, certainly speaks to this freedom. The breath of her words gives her words a shape beyond the page, in air. Indeed, Vicuña’s way of seeing words as clearly as she sees images all began in 1966 when, on a fine summer evening, a word walked into her room. It was a word with gender, legs, and shape. “She had an entire cosmos inside of her little body,” recalled Vicuña during her lecture. A second vision came, then a third, each time clarifying how her art would take form. It was through another one of these visions that, as she recalled in a performance at the Polytechnic of North London in February 1975, she “saw the difference between truth and lies,” and saw the word "Palabrarmas." For Vicuña, language is more than just Cachaco, Quechua, Spanish, Mapuche, and English—the languages in which she works—it is also the form of her work, the way her poems turn into songs during performance, the way her words become drawings, and drawings become words (Vicuña apparently knew how to draw before she learned to speak). One of the delights of roving PALABRArmas is seeing not only how the word “palabrarma” reappears, time and time again, through various iterations of a spade (pala in Spanish) shaped like a "P," but also how words are art. In one sketch, two figures join hands as the word comunicación appears on their arms and passes between their lips. In another, a man and a woman hold a flag that reads pañ while a speech bubble carries the word com, and eros is inscribed on their legs. This sense of having compañeros, of togetherness, is a thread that runs through Vicuña’s art. In 1974, she used silkscreen on paper to fashion a pair of glasses, titled Dar Ver (Anteojos para ver la verdad / To give sight, glasses to see truth). The words on the glasses spell out verdad—truth—and, when flipped, resemble Dar ver—to give sight. There are photos of people wearing the glasses and grinning widely on display at the Neubauer, and around a dozen pairs of these glasses were passed around for a group photo after her lecture last Tuesday. One undeniably has fun at a Vicuña performance; “language wants to play,” she remarked, and indeed so do we. Audience members wear Vicuña's glasses after her lecture of April 3. When introducing Vicuña at the Logan Center last Thursday for her final reading in Chicago, Srikanth Reddy examined “Palabrarma” once more, noting the “hidden” radical in the word—“ala” (wing), a way in which the “root can take flight.” Throughout her work and life, Vicuña certainly pays attention to the “hidden.” During her poetry reading, she paused a number of times to greet (to the audience’s delight) the baby she could hear, but not see, in the room, as well as the background noise of the AC (it reminded her of the ocean). In New York this Friday, she is part of a 120-member group of female artists in the Radical Women: Latin American Art, 1960–1985 exhibition, in part memorializing marginalized, hidden indigenous women. And just as work from PALABRArmas has been hidden for over 40 years, Vicuña tells the audience that she, too, has been hidden. In the past two weeks, however, Vicuña has returned to Chicago, the very city in which she was once lost, reading and sharing her craft. Like the winged spade she draws in her work, Vicuña is taking flight; and along the way, her art and poetry lifts us up, too. Curated by Dieter Roelstraete, PALABRArmas will be on display until June 2. Vicuña’s visit is sponsored by the Pearl Andelson Sherry Memorial Fund, the Program in Poetry & Poetics, and the Neubauer Collegium for Culture & Society.